The new Chairman of The Church of Pentecost, Apostle Eric Kwabena Nyamekye, has formally assumed office. The 6th Chairman of one of the leading Pentecostal churches in the world was inducted into office at a special ceremony held on Saturday, August 25, 2018 at the Pentecost International Worship Centre (PIWC)-Atomic, near Kwabenya in Accra. The historic event which was graced by the 1st Deputy Speaker of Parliament of the Republic of Ghana, Honourable Joe Osei Wusu, was attended by heads of churches and para-church organisations in and outside the country. Among them were Apostle Dr Michael Ntumy (former Chairman of the Church), Bishop Charles Agyinasare of the Perez Chapel International, Rev Clement Anchebah of the Fountain Gate Chapel, Rev. Prof. Paul Frimpong Manso, General Superintendent of the Assemblies of God Ghana, Rev. Dr Joyce Aryee, a delegation from the Elim Pentecostal Churches, UK, and many others from across the world. Also present to grace the occasion were the Deputy Greater Accra Regional Minister, Hon. Elizabeth Sackey; Nana Dr. Susubiribi Krobea Asante, Paramount Chief of Asokore Traditional Council and Member of National Peace Council, and Dr. Nii Kotei Dzani, President of Groupe Ideal and Member of Council of State, among many others. The immediate-past Chairman, Apostle Prof. Opoku Onyinah, called on the members of the Church to wholeheartedly accept the new leader, obey, respect, support and submit to his authority, so that he will have the peace of mind to work with joy. 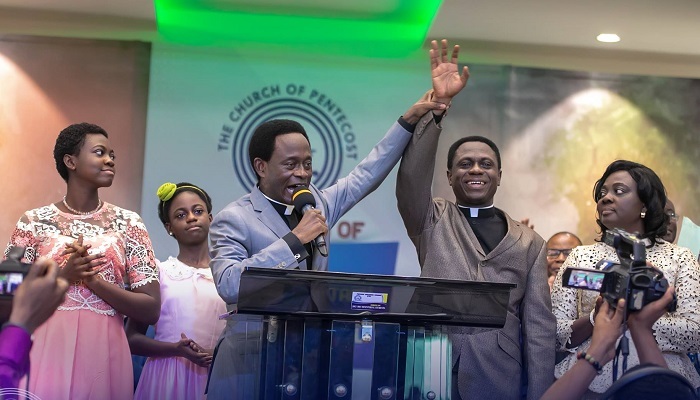 It would be recalled that Apostle Eric Nyamekye, 53, was overwhelmingly elected as Chairman of the Church to succeed Apostle Prof. Opoku Onyinah, who has successfully ended his two consecutive 5-year terms in office. He completed Tema Secondary School in 1983 and proceeded to Nyankpala Agric College in the Northern Region, where he obtained a certificate in General Agriculture in 1986. He also holds a diploma in Human Resource Management from the Institute of Commercial Management, U.K., a post-graduate Diploma in Applied Theology from the University of Manchester, U.K., and a Master of Arts Degree in Religious Studies from the University of Ghana, Legon. Apostle Nyamekye worked with Technology Consultancy Center, KNUST, for three (3) years before he was called into the full-time ministry of The Church of Pentecost in 1991 and stationed at Daboase in the Western Region between 1991 and 1995. He was later transferred to Agona Nsaba in the Central Region (1995- 1999), where he was ordained as a Pastor in 1996. Between 1999 and 2005, he was sent on missions to the Republic of South Africa. He was recalled home in 2005 and stationed at East Legon, where he served as a District Pastor till 2008. He also became the Resident Minister of Atomic branch of the Pentecost International Worship Centre (PIWC) from 2008 to 2011. He was later called into the Office of Apostle and transferred to Tamale as Area Head from 2011 to 2015. Until his election, he served as the Koforidua Area Head of the Church. He is married to Mary and are blessed with six children.